Shamha African Drumming - SHAMHA VIBRATION C.I.C. If you would like to book a Shamha African Drumming workshop or performance for your Community or business event , email shamhavibration@gmail.com or phone Djina 07508 851 335. We would love to hear from you and discuss what sort of event you would like. Meanwhile, you can visit our Facebook page and check out our previous work. Shamha at The Lambeth Country Show in 2017. Drumming together in a group or circle has many beneficial effects. A good hour or 2 hour session can reduce stress and anxiety. You can feel connected to your fellow drummers and improve your brain activity. And you can induce genuine altered states of consciousness by focusing on the action of drumming and the vibrations that the sound creates around and within you. But if you come along and join us for some drumming, you will feel better at the end of the session, regardless of how you explain it. The rhythms we use are specifically chosen to be quite easy to learn, even if you have never touched a drum before, you'll soon be playing along and feeling the benefits that follow. We drum, we think about our breathing and our posture and we enjoy ourselves. Come and join us. Check our Facebook page for times and places and for some photos and footage of previous workshops and events. Dancing in the street, Angell Town, Brixton. Free drumming session at Carnival Del Pueblo, Elephant and Castle. Get together and play the drums. 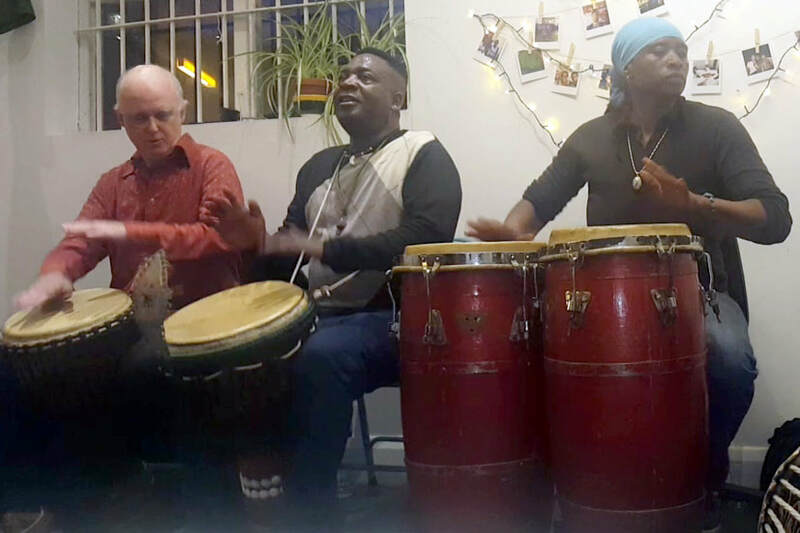 Master Drummer Henri GaoBi performs with Djina and Pete at Gida Brixton. Shamha performance at The Platform. Get up and dance with Shamha. Find peace with your drum. A cora sounds great with the drums. 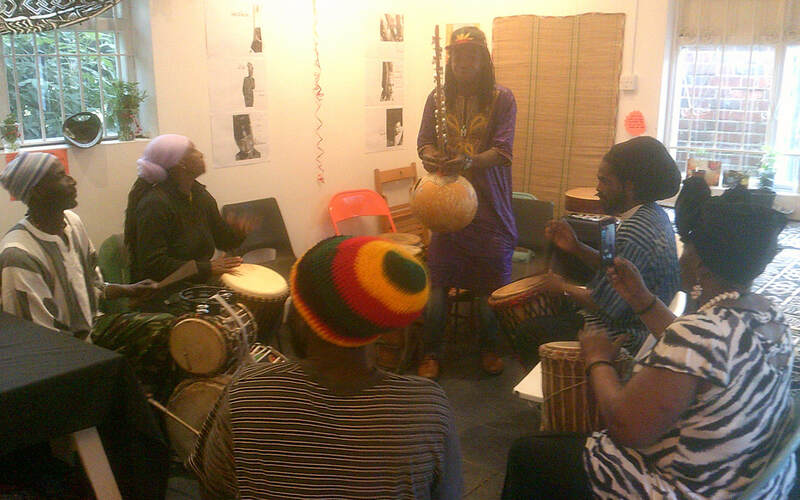 We look forward to hearing from you or seeing you at a Shamha African Drumming workshop or event.